Indian fruit exporters took part in the largest international exhibition of the food industry in Moscow. In order to certify certain products, Russian officials are planning to inspect Indian food processing facilities. For the first time in many years, the Indian agricultural sector representation at the Moscow World Food and Beverage Exhibition was not limited to tea exporters. Among the participants there were also fruit exporters. Suppliers of meat, milk and other products might join them next time. Kalpesh Khivasara, General Manager of INI Farms believes Indian fruit suppliers have great opportunities in Russia. On the sidelines of the Moscow food exhibition, he said there was a demand for grapes and bananas from India. The Managing Director of JSC Vial Inter Niraj Kumar also believes that Russian sanctions may have a silver lining for India, opening the gateway for some of the Indian goods that previously didn't have access to this market. “This, for instance, concerns meat, egg powder and dried milk,” Kumar said. His company sells tea under the brand name Nargis, and supplies Russia with pickles produced in India. Until now India-Russia cooperation in food products has not remarkable, except for supplies of Indian tea that has been popular in Russia for years. Indian coffee suppliers are also widely present in the Russian coffee market. Indian coffee is mainly used for preparation of coffee blends. According to the chairman of India's Agricultural and Processed Food Products Export Development Authority, Russia's share in India's food exports is only 1 percent. During recent talks with Rosselkhoznadzor authorities he noted that Indian suppliers can export buffalo meat to Russia. India is also ready to start supplying milk, cheese, butter and seafood. Until recently, the import of buffalo meat was banned in Russia for a number of reasons. However, it seems that the two countries managed to come to an agreement. 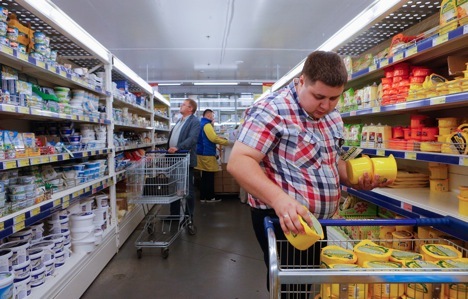 Deputy Head of Rosselkhoznadzor Alexey Alexeenko told RIR that this week it would send Russian inspectors to the Indian food processing outlets that were potential suppliers to the Russian market. The inspectors would assess the suppliers of buffalo meat, dried milk and egg powder, among other goods. The inspection itself, according to the Russian official, would begin within a month. He noted that Russian-Indian food trade has good potential, because it could mean the large volume of supplies. Earlier, in October 2013 Russia rejected Indian buffalo meat, after visiting five Indian processing facilities. However, the country now faces a shortage of beef, as excluding Europe, the US and Australia, there is only one major beef supplier - Brazil. But Brazilian suppliers have started to raise prices for Russian buyers. As for dairy products one, of Russia's largest dairy producers Galactica is in talks with Indian dairy giant Amul for imports of cheese and dried milk. According to the Head of Public and Government Relations of the National Dairy Producers Union Maria Zhebit, Russian companies may be interested in importing cheese and dried milk from India. “In recent years, Russian dairy industry went in crisis — dairy cattle population has dropped and so did the production volume, which caused the shortage of raw milk. Today, Russia's main supplier is Belarus, but India could fill the remaining part of the niche,” she said.